Cairo, Egypt | LOUIS JADWONG | If Uganda Cranes deny the Egyptian Pharaohs maximum points Tuesday night, they will be within reach of the “Promised Land” of World Cup Russia 2018. After stand-in coach Moses Basena said he was the Biblical Moses, ready to lead his team to Canaan, the Uganda Cranes team dared to dream, and by the final whistle on Thursday, had beaten Egypt’s Pharaohs 1-0 to top World Cup qualifying Group E.
It was Uganda’s first victory over the Egyptians since 1965, and in biblical terms, can be equated to Moses parting the waters of the Red Sea for the Israelites to cross. “I’m the Moses to lead Cranes to the Promised Land” said Basena early last week. Reaching the Promised Land as the Israelites discovered, was fraught with difficulties. That is what Cranes face at Alexandria’s Borg El Arab stadium from 9pm. In African football terms, no task is as big as playing the Egyptian Pharaohs at their own home-ground. Uganda -Egypt battles have been far between, and have mainly been friendlies but still always ended with the Pharoahs winning. Since their first meeting in 1962, a Nations Cup match that Egypt won 2-1 in Ethiopia, Uganda has faced their North African opponents 17 other times, with nine of those being friendlies. Egypt have won 13 of those, lost only two (1965 and 2017) and drawn 3. The last time Uganda visited Egypt in a competitive match was in 1995, a Nations Cup qualifying match that the Pharaohs won 6-0. “We picked up a good result against Egypt. We need to build on that. 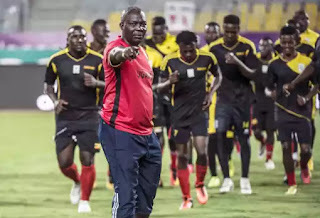 It is this group that will do the job,” said Basena, flanked by Ibra Sekagya and goalkeeping coach Fred Kajoba, at one of the team’s last briefings in Egypt. Basena will hope the experience of many of his players who have faced Egyptian opposition in the past year will count in this key World Cup Africa zone qualifying group match. The stadium is the same venue where goalkeeper Denis Onyango lifted the CAF Champions League with South African side Mamelodi Sundowns in 2016. The likes of striker Derrick Nsibambi helped KCCA beat Egyptian side Al Masry in April. “I know the stadium very well. It will be my second time here but I have great memories on this ground. I hope we can enjoy more great memories as Uganda Cranes on Tuesday” said Onyango on Monday. 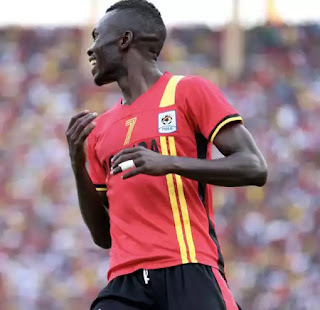 Basena has travelled with the entire XI that started against Egypt last Thursday, including livewire Emmanuel Okwi who scored the only goal, and Farouk Miya who has shaken off an injury. Egypt’s 44-year-old goalkeeper Essam El Hadary is a doubt for the game but Liverpool striker Mohamed Salah will get a second chance after some missed chances in Kampala, and will be the main threat. The other strike options Argentine coach Hector Cuper will have are Arsenal midfielder Mohamed Elneny and City winger Ramadan Sobhy. Egypt have not been to the World Cup since 1990 and anything other than a win Tuesday will put Cuper under immense pressure. Uganda has not been to the World Cup before. Defeat will not completely rule out their hopes, but will raise fears again that the best they can achieve is to get near the promised land, but like the Biblical Israelites, still need a Joshua to go all the way.